^ 1.0 1.1 1.2 1.3 1.4 1.5 Hepatitis. MedlinePlus. [2016-11-10]. ^ 2.0 2.1 2.2 2.3 2.4 2.5 2.6 What is hepatitis?. WHO. July 2016 [2016-11-10]. ^ 3.0 3.1 3.2 3.3 3.4 3.5 3.6 3.7 3.8 Hepatitis. NIAID. [2016-11-02]. ^ 4.0 4.1 Liver Transplant. NIDDK. April 2012 [2016-11-10]. ^ Hepatitis (Hepatitis A, B, and C) | ACG Patients. patients.gi.org. ^ Bernal W.; Wendon J. Acute Liver Failure. New England Journal of Medicine. 2013, 369 (26): 2525–2534. PMID 24369077. doi:10.1056/nejmra1208937. 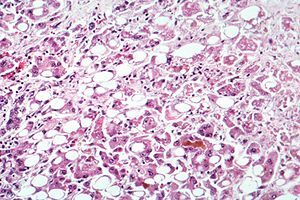 ^ Autoimmune Hepatitis. NIDDK. March 2014 [2016-11-10]. ^ Global, regional, and national incidence, prevalence, and years lived with disability for 310 diseases and injuries, 1990–2015: a systematic analysis for the Global Burden of Disease Study 2015. The Lancet. October 2016, 388 (10053): 1545–1602. PMC 5055577. PMID 27733282. doi:10.1016/S0140-6736(16)31678-6. ^ Basra, Sarpreet. Definition, epidemiology and magnitude of alcoholic hepatitis. World Journal of Hepatology. 2011, 3 (5): 108–13. PMC 3124876. PMID 21731902. doi:10.4254/wjh.v3.i5.108. ^ Global, regional, and national life expectancy, all-cause mortality, and cause-specific mortality for 249 causes of death, 1980–2015: a systematic analysis for the Global Burden of Disease Study 2015. The Lancet. October 2016, 388 (10053): 1459–1544. PMID 27733281. doi:10.1016/S0140-6736(16)31012-1. ^ Statistics & Surveillance Division of Viral Hepatitis CDC. CDC. [2016-11-10]. ^ Online Etymology Dictionary. Etymonline.com. [2012-08-26]. ^ U.S. Food and Drug Administration. 2000 Safety Alerts for Human Medical Products. U.S. Food and Drug Administration. [12 December 2012]. ^ Bastida G, Nos P, Aguas M, Beltrán B, Rubín A, Dasí F, Ponce J. Incidence, risk factors and clinical course of thiopurine-induced liver injury in patients with inflammatory bowel disease.. Aliment Pharmacol Ther. 2005, 22 (9): 775–82 [2006-06-30]. PMID 16225485. （原始内容存档于2006-07-14）.